Miles Franklin sponsored this article. Part one is available here. Gold prices have fallen hard since April – closing at $1,231 on July 20. They will rise someday soon, but when, like when will markets crash, is unknown. 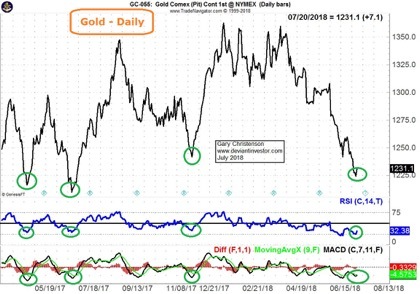 In the short term: Gold prices are low, the Commitment of Trader’s data shows a bottom, half-yearly cycles are bottoming, and technical indicators show over-sold conditions. 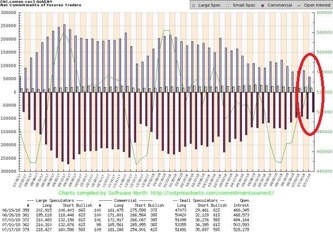 Commitment of Traders: See this article and examine the graph of COT data. 2. 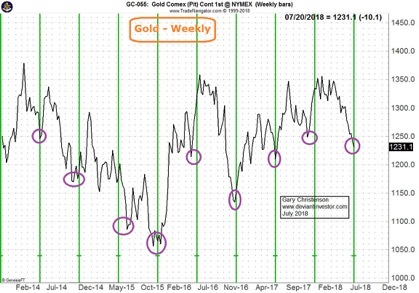 Cycles: Examine this graph of weekly gold prices. The vertical green lines are 27 weeks apart. Each line is close to an important bottom. 3. The RSI (relative strength index) is a timing indicator that ranges between 0 and 100. A reading of 30 is low and shows an over-sold condition. 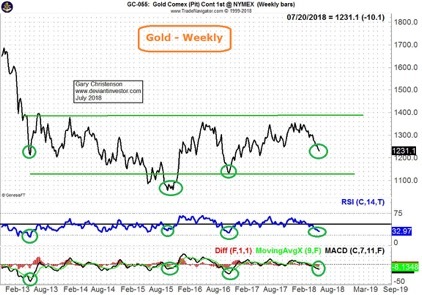 Examine the daily and weekly gold charts and their RSI readings. 4. The MACD uses moving averages and often shows bottoms and tops. Examine the daily and weekly gold charts and their MACD readings. 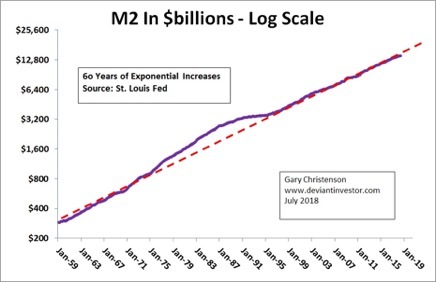 M2 is a measure of currency in circulation reported by the St. Louis Fed. I graphed their data on a log scale. The upward sloping line shows an exponential increase from $289 billion in 1959 to over $14,000 billion in 2018 as debt increased and bankers devalued dollars. The financial system resets to something unknown. An increasing M2 pushes prices for food, shirts, cigarettes, payoffs, gold, crude oil and the S&P 500 Index higher. 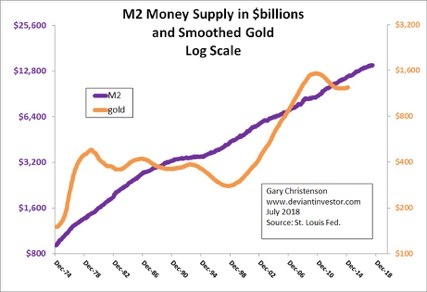 Note the long-term correlation between the smoothed (48 month simple moving average) of monthly gold prices and M2. The following log-scale graph shows the sum of gold times 1.33 plus the S&P 500 Index. The 1.33 weighting factor is the average ratio of the S&P to gold over 33 years. Conclusion: M2 will rise until some drastic event or reset occurs. Gold and the S&P 500 and many other prices will rise along with M2. Since the Fed is expected to maintain a stable dollar, lying about inflation is important. Governments don’t want voters to realize their monetary policies, excessive spending, wars, massive debt and corruption create consumer price inflation, so they “adjust” inflation statistics. Conclusion: Ignore the “official” CPI and inflation statistics. Instead, look at M2 (above), or national debt, or total debt securities per the St. Louis Fed. 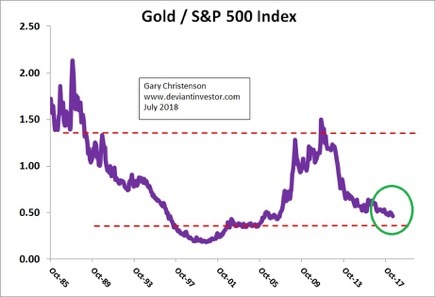 From part one: The following graph shows that gold prices are low and the S&P is high. Ignore political posturing, manipulations, pumping agreements, OPEC and economic noise. In the long-term gold and crude oil prices will rise along with M2. 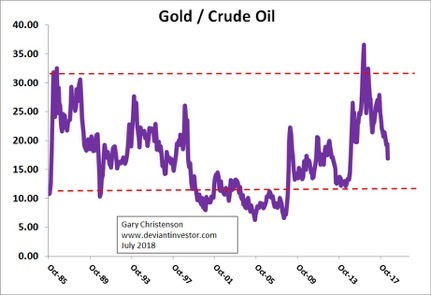 Over decades the gold to crude oil ratio has remained within a flat trend channel. The ratio fluctuates, but is more or less constant. Cycles, COT data and technical timing indicators indicate gold is at or near a bottom. M2 rises exponentially over many decades to benefit bankers and politicians, so it will continue. The sum of gold plus the S&P rises along with M2. Gold prices are low in 2018 compared to the S&P 500 Index. Crude oil and gasoline prices will rise and fall next week, next month and next year. But based on decades of financial history, gasoline and crude oil prices will be priced higher in five years and much higher in ten years as the dollar is devalued. Daily, weekly and cyclic graphs show gold is over-sold and at or near a bottom. Neither politicians nor bankers want changes to a financial system that benefits them. Until the financial system resets, expect rising M2, gold prices, S&P 500 Index and crude oil prices. 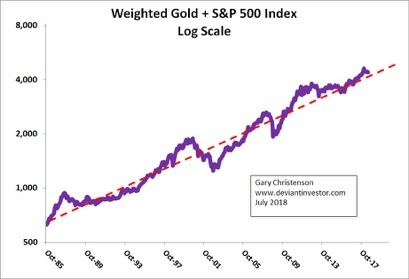 Decades of financial history show that gold prices are low in 2018 compared to the S&P 500. Expect a reversal. Gold prices probably will be several (many) times higher in a few years. Miles Franklin has no influence on M2, crude oil prices or inflation statistics. They sell gold and silver. Call them to protect your savings and retirement from continual dollar devaluations.